NOW, this is an exciting rice recipe. My thrifted, 1961, Reader's Digest supplement, 60 Exciting Rice Recipes, boasted the gag-worthy Ham 'N' Rice Ring, with accompanying photo of the Spam-speckled, moulded rice dish and spoonful of boiled peas heaped in the middle for further gag inducement. Exciting? Nuh-uh. There were a few mildly titillating nods to the grand rice eating populations of Asia with a 'Bengal Rice Curry' - the exotic ingredients being curry powder and an apple - and a double page of Chinese dishes that would have made any rural Chinese takeaway a little nervous about what the good folks of their town could now cook at home. Again, the 'exciting' exotic ingredients extended to soy sauce and pineapple, with the curry powder making an appearance again in a 'Chinese Style Curry' - don't ask, just assume cornflour makes an appearance. Now, my own Thai flavours are none too fancy, but thank goodness things have moved on a bit and we can now get interesting and sometimes exciting ingredients from most suburban supermarkets. And, should you be hunting for a quick and easy TV dinner, here it is. Happy fast, 'exciting' weekday cooking to you all. Cook the rice and leave to drain and cool a little. In a wok, or frying pan, heat the oil. Toss in the onion, chillies and garlic and fry off until the onion is soft. 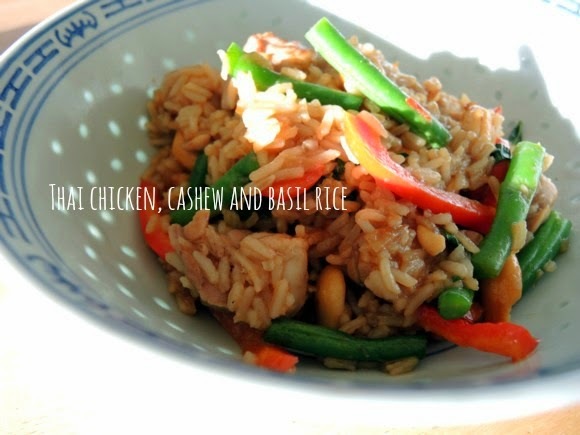 Add the capsicum, beans and cashews and stir fry until vegetables are glossy. Add the rice and toss through all ingredients. Add the sauces all at once and again toss through all ingredients. Add the basil and toss once more. Serve, and enjoy with a cold beer. I think I shall be making this later this week, yum! Also have a stack of basil in the garden. Although your retro recipe book made me hanker for some of my mum's famous sweet and sour meatballs, 80's style (can pineapple, brown sugar, dash of vinegar, definitely some cornflour! ).